NSW waste transporters will face a number of new measures designed to prevent waste being sent to Queensland landfills including a “proximity principle” which means that it will be an offence to transport waste more than 150 kilometres by road from where it is generated. The Sydney Morning Herald reported this week that the Government would introduce tracking devices, transport restrictions, and large fines in a bid to stop the estimated 400,000 tonnes of NSW waste that gets transported to and dumped in Queensland each year. 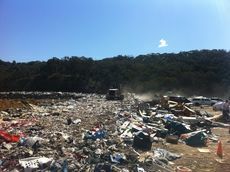 The adoption of a “proximity principle” for waste management in NSW means that from 1 November 2014 it will be an offence to transport waste more than 150 kilometres by road from where it is generated. Companies caught illegally transporting waste will be fined $15,000, while individuals will be fined $7,500. Additional regulations currently before the Upper House would allow the NSW EPA to install GPS tracking devices on trucks considered to be at high risk of breaking the rules. The amount of waste shipped into Queensland has increased significantly since the Queensland Government eliminated the state’s waste levy in 2012. NSW waste contractors aren’t the only ones taking advantage of this change – operators in Victoria also regularly truck contaminated soil across NSW into Queensland to avoid levies in the southern state. Illegal waste dumping and landfill levy avoidance undercuts legitimate operators, distorts the market, results in costly clean up operations, and puts community and environment health at risk. Increasing landfill levies is a critical measure for boosting recycling rates and creating “green jobs”. According to the Waste Contractors and Recyclers Association of NSW, the state can generate nine new jobs for every 10,000 tonnes of recycled waste.